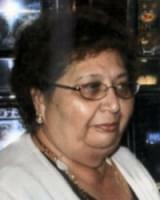 It is with heavy hearts that we, the children of Bernice “LaLa” Griego, announce her passing. She has left us only to be reunited with the love of her life, Jose, who preceded her in death. Mom left this earth on Friday, April 18, 2014 at her home in Gilbert, AZ with her family at her side. numerous nieces, nephews, cousins, and friends. Services will be held May 2nd, 2014 in Miami, AZ at Our Lady of the Blessed Sacrament Church. Rosary will be at 3:30 pm with Mass and reception to follow.